Earlier this month, the Department of the Interior issued more information on President Trump’s executive order directing Interior Secretary Ryan Zinke to review national monuments designated since 1996. The release lists out the 27 monuments under review and references a formal comment period for Bears Ears, which ends on May 26. The release strangely touts this comment period as the “first ever” opportunity for the public to weigh in on national monuments, despite the active effort by the previous administration to gather information from all sides of the debate on Bears Ears — both in a record-breaking crowd at a public forum in Bluff, Utah last July, and a well-publicized request for internet comments issued in 2016. Start with who you are and your personal connection to Bears Ears. Identify credentials that may distinguish your comment from others. Are you an archaeology enthusiast, backcountry hiker, or local business owner? Say so! The existing size of Bears Ears National Monument is the smallest area compatible with its proper care and management because it lies in a geography that contains one of the highest densities of archaeological sites in the United States. It represents a significant compromise with state and local interests, being half a million acres smaller than the area the Inter-Tribal Coalition proposed for protection. The monument already leaves out many significant cultural, historic, and scientific sites; rock art; historic and prehistoric structures; sites of scientific interest; areas of stunning geology; and areas rich in largely unstudied paleontology. To shrink the boundaries further would leave out tens of thousands of sites that meet the definitions found in the Antiquities Act, and would greatly compromise the ability of the tribes and land managers to care for the irreplaceable items named in the monument’s proclamation. The Obama administration went to great pains to consider and accommodate extractive uses of the land around Bears Ears, drawing out areas currently leased for (but not actually producing) oil and gas, and excluding an area of significant size for possible future uranium mining. 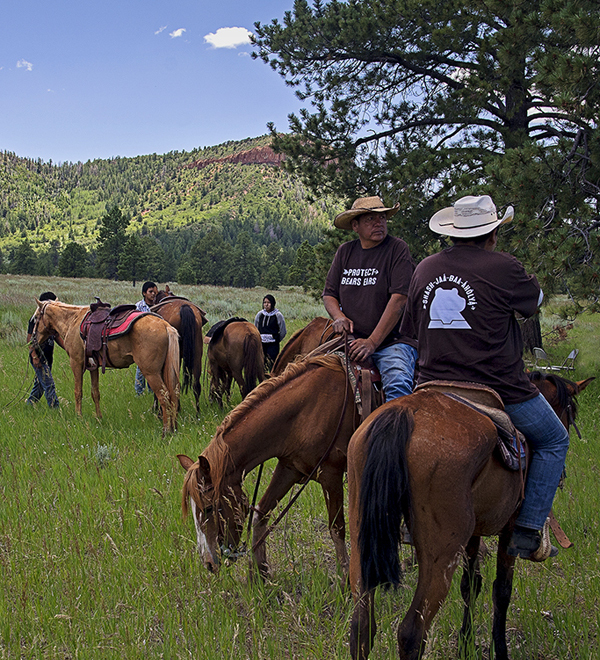 National monuments allow most multiple uses of the land to continue, and the Bears Ears proclamation mandates that motorized vehicle use, livestock grazing, plant and firewood gathering, and hunting and fishing continue. Bears Ears National Monument has been explored for oil and gas for nearly a century, and no marketable quantities of fossil fuels have been found. National monuments can only be designated on federal lands, and private and state lands remain unchanged. Private landowners can still access their parcels, and most private inholders in Bears Ears support the monument. State land exchange, a net benefit to both the monument and the Utah Permanent School Trust, will actually improve revenue generation for Utah’s schoolchildren, and the monument should be serving as a mechanism to help that exchange occur. Headwaters Economics, a non-partisan research firm, found that national monuments have a positive impact on local communities. The profile of the area has grown with designation, triggering interest in new investment and new business. Business owners are receiving requests for visitor information on Bears Ears, and the designation is leading to increased economic opportunities for Bluff residents. Just try to book a hotel in Bluff this weekend — there are no rooms available. More than 300,000 people signed petitions urging monument designation, and the monument is supported by 30 regional Native American tribes, the 200+ tribes of the National Congress of American Indians, six of seven local Utah Navajo Chapters, the Bluff Special Service District, and the Utah Democratic Caucus, among many others. A recent poll found 80 percent of westerners want to keep our national monuments as they are. Funding for land management is the responsibility of Congress, and the worst possible step to take for Bears Ears would be to remove or reduce its protected status. A record number of visitors are coming now, and education around responsible visitation is essential to ensuring that the American public can learn about, and love, the Bears Ears region with respect. Local land managers on the ground are already taking steps to improve resource protection, and the Department of the Interior should be advocating for increased funding for Bears Ears from Congress. This is our chance — let’s make sure the secretary hears from Bears Ears supporters by July 10! Or, if you’re pressed for time, customize your message here and we can send your comments to Secretary Zinke through our platform. It is vital to protect bears ears as conservation zone. Please keep Bear Ears the way it is. It's too beautiful to not support and protect. Please do not change the current designation if this national treasure, with important native meaning. I am commenting in support of the Antiquites Act. The Bears Ears has been designated as a national monument, and that is the last word. The future and integrity of a national monument is not reversed at the whim of a sitting president. Hands off the Bears Ears National Monument, and any other monument that tRump thinks he can railroad into destruction. I am writing in the hopes that you will protect Bears Ears National Monument. Can you imagine New York City without Central Park or San Francisco without Golden Gate Park? Leaders chose natural preservation over financial gain in those cases. They were very good decisions in retrospect and they increased the values of the cities in the long term. Bears Ears is similar, but on a larger scale. It is a slice of nature that provides an essential retreat from otherwise hectic urban lives and it will enhance the value of the country as a whole if it is left natural. Future generations will thank you if you protect it, much as we thank the leaders who preserved Central Park and Golden Gate Park (and Yosemite, Yellowstone, etc.). I have visited Eastern Utah several times, including a trip on Lake Powell, and have wonderful memories of the region. I look forward to visiting the region again, this time with my family. Thanks for this great post. i really appreciate your blog. The best place for learning.